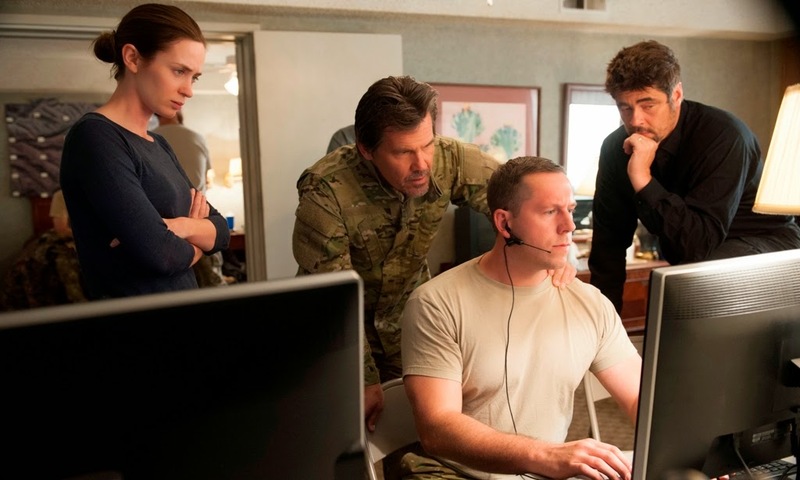 Kate Macer (Emily Blunt), Matt Graves (Josh Brolin, left center) and Alejandro (Benicio del Toro, right) in Sicario. In so many ways this is the culmination of Villeneuve's capacities of a filmmaker. It has the brutal and shocking violence of Polytechnique, some of the procedural elements of Prisoners, and much of the confidence, experimentation and sense of dream that made Enemy so interesting. It's the collision of these sensibilities - the art film, the action movie - that Villeneuve shines, creating a marvelous hybrid that's a stunner. A film that at times feels like an adventure, while at others it affects one like a stab in the stomach, Sicario's dagger plunges deeply. Its ethical ambivalence combined with its superbly executed filmmaking makes this a very special film indeed, a showcase of a great Canadian talent at the top of his creative and technical game. Bravo, Monsieur Villeneuve, bravo. While Villeneuve expertly stages the film’s action elements with a patient eye that is rarely seen in commercial cinema, screenwriter Tyler Sheridan has no intention of ignoring the political realities at play. Even if only half of what transpires in the film is true it’s an indictment against every strategy the U.S. and Mexico have put forth this century. Villeneuve and cinematographer Roger Deakins worked brilliantly together on Prisoners while employing a very dark palette of blacks, gray and deep greens. Their collaboration here is equally great in a story and setting defined by parched desert tones, cheap and impermanent buildings and vast pale blue skies. A preponderance of scenes involves haves and have-nots of information or situations in which it’s unclear what the characters are really up to. The blocking, framing and use of lenses accentuate these disparities in ways that expertly heighten the tension and sense of uncertainty. There are also terrific aerial shots that show the border, including portions of the American-built fence, with great vividness. With a worldview as dark as night and a moody look brilliantly captured by the great cinematographer Roger Deakins, Villeneuve’s film is state-of-art blackness, though it’s also brutal enough to have caused walkouts... It’s a violent, bleak exploration of a bottomless moral quagmire, and Villeneuve is certainly a skilled enough filmmaker to pull it off... Still, you’d be hard-pressed to find a more brutally accomplished thriller at the festival this year. To borrow a word from a previous Villeneuve film, “Sicario” takes no prisoners. Villeneuve is truly a master director (just watch his choice of shots at times, like the big Brolin vs Blunt argument that happens entirely in a long shot with both their figures small in the frame), and there are curious flourishes in "Sicario" that remind us there's a singular sensibility behind the camera. [...] "Sicario" features neither the twistiness of "Prisoners" nor the weirdness of "Enemy," and so is just a very solid procedural that eschews bigger drama in favor of a continual slow build... to nowhere in particular. Perhaps that build even extends beyond the film's ending, to make us most excited, not for "Sicario" so much as for what Villeneuve does next. With a menacing tone that holds tight from start to finish, the movie finds Villeneuve entering Michael Mann territory, building a grim story of cartel warriors on both sides of the Mexican border and the baffled innocent officer caught in the crossfire. Aided by icy turns from Emily Blunt, Benicio Del Toro and Josh Brolin, the taut narrative marks another fine example of Villeneuve's expert craftsmanship. At the same time, the sheer density of filmmaking talent makes its facile story stand out. Villeneuve maintains a consistent forward momentum aided to a large degree by cinematographer Roger Deakins' sophisticated widescreen shots that cram each frame with moody details. A masterful shootout set on a highway is dynamically assembled with pulsing momentum, built from a rich blend of overhead shots, frantic closeups and abrupt bursts of violence. Few modern directors assemble sheer tension with such mechanically precise finesse. The spaced out narrative gifts Villeneuve the time needed to inject style into a film that in typical hands would have been dominated by plot; blacked-out cars slink through the streets of Juárez on an illegal raid with grace and Zero Dark Thirty’s nighttime raid gets a strong rival in the form of third act mission seen mostly in nightvision and infa-red. Roger Deakins frames this all with the measure you expect from him; wide-lensed landscape shots that highlight the sparsity of the backdrop are a real highlight, but the action beats, which the director builds up to slowly with plenty of tense calm before the storm, are smooth and coherent. A recurrent loud drone that persists throughout only adds to the absorption and dread. Blunt, as ever, looks so slender and fine you are always worryingly aware of her fragility among all these scary men — that face, naturally so pretty, going so bleak. That works. She’s turning into a stunningly good action hero (Looper, Edge Of Tomorrow) and altogether this is a thrilling film, expertly directed by the French-Canadian Denis Villeneuve (Prisoners, Enemy) whose next project is the Blade Runner sequel. SICARIO is the best looking film I've seen at #Cannes2015 / this year. God bless Roger Deakins.